For 23 years, the Amway Arena served as the grand venue in Orlando, serving up everything from headlining superstar muscians to being the home of the Orlando Magic and other sports teams. 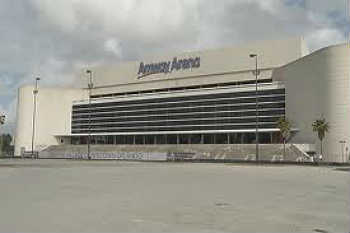 Then the Amway Arena gave way to the expensive Avway Center nearby and it has laid dormant for several years. Sunday the O-Rena (as we locals first called it before the corporate branding turned it into the TD Waterhouse Arena and then the Amway Arena) will host one last big show: its own implosion. In the early am of Sunday, March 25, the whole building will be imploded to make way for the “Creative Village” the city has planned to build on the grounds. The first blasts are scheduled for 7:30am, and all of the local news outlets plan to cover the event live.starting around 7am. The streets immediately surrounding the venue will be closed from 5am until 9am to make sure nobody drives by just as everything explodes. If you want to see it in person, I’m told there will be a viewing area on Colonial Dr, just across the lake from the Amway Arena. Those who live and work in the area should take precautions for the possible cloud of dust and debris that may blow their way and keep all doors and windows closed. There will also be police stationed on I-4 ready to close that down just in case the dust cloud heads east and impacts visibility. I saw many concerts at the Amway Arena. Did you? What was your favorite show or sporting event you saw there? Share your memories of the O-Rena in comments.